The administration block has many of the miscellaneous controls of each course and is broken into three sections. Edit or Stop Editing: This is another way to Turn Editing On & Off. It is the same as using the Edit button at the top right of the page. 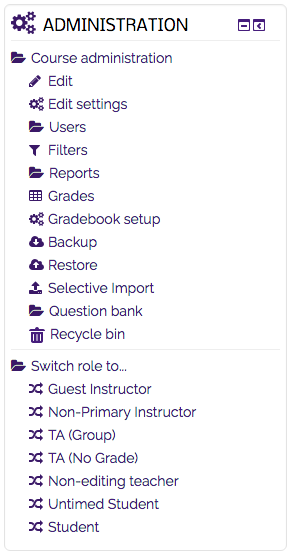 Users: This collapsible sub-menu allows the instructor to enroll other users and manage groups. Enrollment Methods: This is a collapsible menu that leads to manual enrollments which will be explained next. Filters: Options for activity name auto-linking, emoticons, and algebraic notation. Grades: This option takes the user to the gradebook. Gradebook setup: Allows you to edit the assignments in your gradebook. Backup: Allows the user to export an Archive.zip backup file of the current course. Restore: Allows the user to import a previously saved Archive.zip backup file of the course. Selective Import: Will allow an instructor to choose specific content from another of the instructor's current courses. This does not work from an archived course. Question bank: This drop down menu allows the user to manage questions for quizzes. Recycle Bin: Allows the user to view/restore any previously deleted assignments. Switch role to: This collapsible menu allows the user to view and operate Moodle from the perspective of another role. For example, if you switch your role to Student, hidden items will no longer display.